Vigilance behaviour in gregarious species has been studied extensively, especially the relationship between individual vigilance and group size, which is often negative. 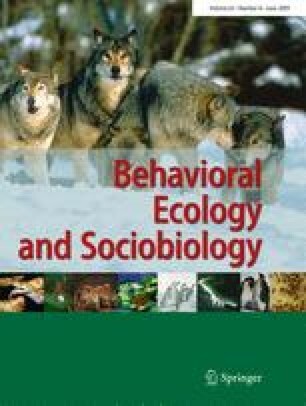 Relatively little is known about the effect of conspecifics on vigilance in non-obligate social species or the influence of sociality itself on antipredator tactics. We investigated predator avoidance behaviour in the yellow mongoose, Cynictis penicillata, a group-living solitary forager, and compared it with a sympatric group-living, group-foraging herpestid, the meerkat, Suricata suricatta. In yellow mongooses, the presence of conspecifics during foraging—an infrequent occurrence—reduced their foraging time and success and increased individual vigilance, contrary to the classical group-size effect. Comparing the two herpestids, sociality did not appear to affect overt vigilance or survival rates but influenced general patterns of predator avoidance. Whereas meerkats relied on communal vigilance, costly vigilance postures, and auditory warnings against danger, yellow mongooses avoided predator detection by remaining close to safe refuges and increasing “low-cost” vigilance, which did not interfere with foraging. We suggest that foraging group size in herpestids is constrained by species-distinct vigilance patterns, in addition to habitat and prey preference. We thank Tim Clutton-Brock, University of Cambridge, for support and allowing us to work on the Kuruman River Reserve as well as the use of long-term life history data on meerkats. Thanks go to Helen Eaton and Samuel Guiton for their assistance in data collection. We would like to thank the Roche Research Foundation (Switzerland), Harry Crossley Foundation, and National Research Foundation (South Africa) for financial support during this study. MBM was financed by the Swiss National Science Foundation, SNF-Förderprofessur Nr 631-066129. This study was conducted with ethical clearance from the Ethical Committee of the University of Stellenbosch and under licence from the Northern Cape Department of Nature Conservation.